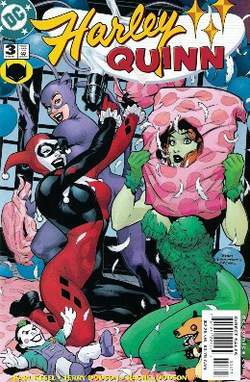 Harley Quinn #3 © 2001 DC Comics. COVER ART BY TERRY AND RACHEL DODSON. Harley Quinn, the breakaway character from Batman: The Animated Series (1992–1997), is at heart just a girl who's head over heels for a guy— but in Harley's case, she's “hopelessly in love with a murderous psychopathic clown”: the Joker. She wasn't always a jester-clad, chalk-faced, superhumanly agile moll. Behind the makeup is— actually, was, since her original identity has been lost to her certifiable lunacy—Dr. Harleen Quinzel, a psychiatrist at Arkham Asylum for the Criminally Insane, where Gotham City's malicious madmen are penned and padded-celled after being apprehended by Batman. Quinzel studied the incarcerated Joker's psychotic mind, and was mesmerized by his homicidal tendencies and warped sense of humor. After lending the Joker a helping hand in escaping Arkham, she next lent him her heart, joining her “Puddin'” as the pining princess of plunder, Harley Quinn. You can't blame a girl for falling for the Joker's seductive smile and wicked wit; as Harley says of “Mr. J,” in the voice of actress Arleen Sorkin, “Gee, boss, you really know how to put the fun in funeral.” “Originally, Harley was only supposed to be in one episode,” remarked Batman: The Animated Series (BTAS) writer Paul Dini in a 1994 Cinefantastique interview, “but she was very appealing and she added this other dimension to the Joker; most of his henchpeople are pretty expendable.” Not that the mercurial Clown Prince of Crime hasn't tried to dump her. He's given her the slip, and the slap, and even strapped her to a rocket for a “final” send-off, but she keeps returning for more—or he calls her back (but usually for an ulterior motive), making the Joker and Harley Quinn the ultimate codependent supervillain couple. After her intended one-time outing in BTAS's episode seven, “Joker's Favor” (original airdate: September 11, 1992), Harley kept popping up on the show with and without Mr. J, and has followed him through a variety of subsequent animated series: Superman (1996–2000), The Adventures of Batman & Robin (1997–1999), Static Shock! (2000–2004), and Justice League (2001–2004), as well as the made-for-video animated movie Batman Beyond: Return of the Joker (2000). Harley even rode the Clown Prince of Crime's purple coattails into comic books, first in DC Comics' BTAS tie-ins written and drawn in the “animated” style and later in the darker “real” DC Universe, beginning with the 1999 one-shot Batman: Harley Quinn, then continuing with her own monthly series Harley Quinn, which ran 38 issues from 2000 through 2004. Harley enjoys a Thelma and Louise–like friendship with fellow Bat-rogue Poison Ivy, from whom she received an herbal application that makes her immune to toxins, and adores her pet hyenas, which she affectionately calls her “babies.” She has been the subject of action figures, statues, and even a 2005 limited edition (1,007 produced) hand-painted marionette retailing at $290.95! Not bad for a downhome gal with a wild streak (“Trouble? Don't mind if I do!”) and a dream of one day settling down and raising (demented) kids with her Puddin'. Mia Sara played Dr. Harleen Quinzel in the live-action TV series Birds of Prey (2002–2003). In the concluding moments of season one's final episode she appeared in a modified Harley Quinn costume, but the series' cancellation stalled Sara's Harley. The game offers 30 playable Super Heroes and Super Villains, including Batman, Superman, Wonder Woman, The Joker and Harley Quinn, each with his or her own signature moves, abilities and costumes. Golden Bear's range is designed to appeal to younger DC fans, enabling kids to create their own Super Hero adventures at home with Batman, Superman, Wonder Woman, The Joker and Harley Quinn. WIN! DC SUPER FRIENDS TOYS! Owing to her performance as Harley Quinn, moviegoers have been clamoring for the return of actress Margot Robbie to the big screen as the comic book character. HARLEY QUINN ANIMATION NETFLIX has created a monster in that everyone is now trying to emulate its success. Gotham City Sirens" - Harley Quinn (Robbie) teams up with Poison Ivy and Catwoman in this female-fronted flick. Apparently, the current pitch for the sequel is that it will revolve around Harley Quinn and her team trying to hunt down a lost "weapon of mass destruction". But nowadays Halloween costumes are a big deal, heavily affected by Pop culture; you are more likely to see people dressing up as Harley Quinn, Joker or Jack Sparrow nowadays than good old ghosts. Speaking of danger, the psychotic psychologist Harley Quinn takes centerstage in "The Pact. He is also attached to a new Tron movie and will reprise his role as The Joker in a recently announced spin-off with Margot Robbie returning as Harley Quinn. Last year, a few girls I knew were talking about going as Harley Quinn [from Suicide Squad]. fans across the globe will be donning costumes and celebrating the iconic movie favourite tomorrow, and at Stockton's Geek Corner, Regency West Mall, they will be celebrating all things Batman and Harley Quinn as it welcomes fans from 10am. This year Sienna's latest craze is supervillain Harley Quinn, one of the main characters in her favourite movie.